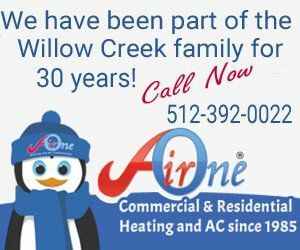 The Ridge at Willow Creek Section II Homeowners Association, Inc.
First developed in the mid-1990’s, The Ridge II HOA is a part of the Willow Creek neighborhood located on the southwest side of San Marcos, Texas, and is composed of 87 lots. So there is no confusion, we’re going to explain the unique circumstances of the HOAs in our area. All properties in The Ridge II HOA are actually in two HOAs. Willow Creek Homeowners Association (WCHOA) covers the entire Willow Creek subdivision (15 different sections with slightly different restrictions and approximately 475 residences). Property owners are automatically voting members, subject to compliance with all restrictions, with voluntary $20/year dues. The dues are used to fund website manage­ment, secretary expenses, April neighborhood garage sale advertising, annual meeting refreshments and other things. You can read more about the WCHOA in the “About Us” section on this website. The Ridge II HOA was developed later and has mandatory dues of $200/year which was set up in the deed restrictions when this section was developed. There are 87 lots with 74 actual residences. Several families own more than one lot. The streets included are most portions of Summit Ridge Drive, and only a block or two of Ridgecrest, Tate Trail, Stagecoach Trail, Willow Arbor and Great Oaks. The dues are used to maintain four entrances (mowing + planter mainte­nance, water, electricity), annual meeting expenses mailing, administrative expenses, board liability insurance, etc. If you need a copy of the document that was recorded at the Hays County Clerk's Office, click here. This file will take longer to load and print. For the last two years, our HOA annual dues have been $190. At the last Board meeting, it was unanimously voted to raise them to $200 per year. Our dues generate funds which pay maintenance, water and electricity for our four entrances, annual meeting costs, newsletter mailings, liability insurance for board members, and office supplies + compensation for our treasurer. This past November, we paid Puentes Painting to refresh our four entrances at Ridgecrest, Willow Arbor, Stagecoach and Tate Trail. They repaired damaged iron posts, power washed moldy brick walls and pillars, and repainted the rusted and chipped fences as well as the "Ridge II" wording. The fences were last painted in 2007-08. They were in bad shape and in need of attention. This $4700 expense in particular necessitated the dues increase in order to replenish our treasury. Deed restrictions mandate that dues are payable in January and will be considered delinquent this year if not paid by January 31, 2017. Avoid a late fee of $36 per lot by mailing your payment in early. Please click the link below to print the proxy form. To send large files over 2MB as well as additional photos and documents, please send them via email to wchoa99@gmail.com. Below are links to the Declaration of Covenants, Conditions, and Restrictions for the sections that comprise "The Ridge at Willow Creek Section II Homeowners Association, Inc."
Click on the link to read and/or print the restrictions and covenants. Restrictions and Covenants for other sections of Willow Creek Estates may be found on the Willow Creek Homeowners Association (WCHOA) website here.